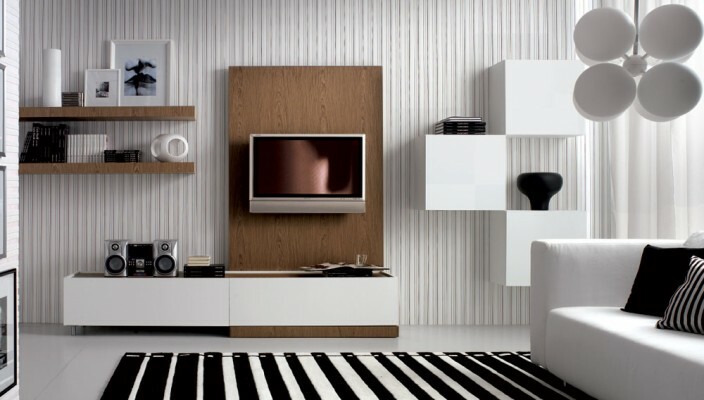 Zebra stripes pre-dominate the theme of this living room. Walls are done in thin white stripes. Carpet is done bold black and white stripes. Sofa is white with one black cushion and one striped cushion. Four ball shaped ceiling hanging which is grayish in color and used to hold light bulbs is present. The TV is mounted on a brown board. There is a stereo to the left side of TV and black and white pictures of a tree placed on upper shelf of the room. There is a white alarm clock placed on the lower shelf. There is a pot like structure placed on white squares made on the wall. The white curtains on the window are most appealing. Various black and white show pieces are available in the room. There are wall hangings peeping out of the sides. The decor of the room gives it a warm and happy feeling.